Jessie Harrison (formerly Abbate) doesn't only usually win the Women's Division when she shows up at a USPSA match; she beats most of the men as well. Only the second woman ever to earn a Master Class ranking in USPSA, she currently holds 25 national and 19 world championship titles across five different disciplinesâ€”IPSC/USPSA, Bianchi Cup, 3-Gun, Steel Challenge and Cowboy Action shooting. Like many shooters, she was introduced to firearms by her father. "My dad shot IPSC in the early '80s and he moved over to Cowboy Action shooting, and I followed him," she says. "It got to the point I was always at the range with him, and he kept saying 'Why don't you shoot?'" One day when she was about 15 years old she finally took him up on his offer, and the rest is history. "Once I started, after that first match I felt my competitive drive kick in," she says. "I was always very competitive, but once I shot my first match a competitive drive kicked in that was unlike anything I ever experienced. I immediately wanted to do better. I would set reasonable goals for myself, and once I reached them I would think about what I need to work on next. I just kept going until in Cowboy I got to where I was." Harrison's SASS alias is "Jasmine Jessie," and "where she was" was good enough to win world championships and be featured on the Outdoor Channel demonstrating her lightning-fast shotgun reloads. She still wanted to improve, however, and so made the transfer over to what she calls "the modern disciplines." And if you want to see Jesse in action, you can see video here. Currently sponsored by a number of major companies including Leupold, Hornady and Benelli, Harrison's practice regimen is serious business. "I'm usually on the range every day, she says. "I know that sounds crazy, but this is what I do for a living, so I'm on the range four to five days a week and usually shooting a local match on the weekends. If there are days I can't get to the range due to weather or other things I definitely dry-fire as well. I usually try to dry-fire two to three times a week, 30 minutes each time. "I always tell people dry-firing one of the most important tools in my bag because it doesn't cost me anything. I don't have to worry about running out of ammo, and when you dry-fire you unveil mistakes or things that you might be doing wrong that aren't visible in live fire, because there's no recoil to offset it." Anyone who has ever watched Harrison shoot knows she brings a physicality to the sport that is rarely seen in female competitors. That didn't happen by accident. "I've been doing a lot of free-weight training this year, just getting the muscle mass that I need because it's such an athletic sport," she admits. "To compete at the level I want to, I feel that I need to stay in the best shape possible, and I think that the weightlifting gives me that extra edge. "Women don't have the upper body strength so we can't control the gun or be as aggressive as men," she notes. "We're not built the same. If you'll notice my stance I try to offset that. I have a really wide stance, a very aggressive stance, so that I can control the gun. If I didn't, I'd be all over the place. That's why I spend so much time working out." Harrison has noticed a huge difference in how she handles the gun just since the 2010 USPSA Nationals (she was Ladies Champion in Limited Division) due to her increased weight training. 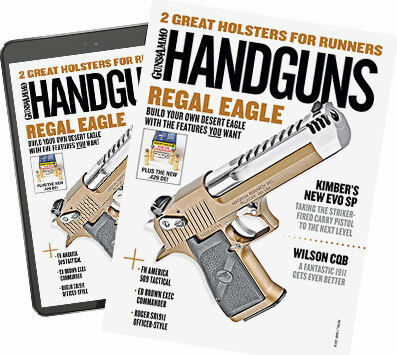 In USPSA's Limited Division Harrison shoots a six-inch barreled high-capacity 1911, not a small or light gun by any means, but the weight doesn't bother her. She, like many of the male competitors, likes the longer sight radius of a six-inch gun. Harrison has won several 3-Gun titles in years past, but she set the long guns aside to focus on her handgun skills. Now she's ready to come back. "I really enjoy shooting 3-Gun, partly because of the similarity to Cowboy shooting using all three guns, but it's a lot more to train for. I've got three guns I've got to practice with now instead of one." In addition to all that, Harrison is a host of the NRA show "Friends of NRA" and an avid hunter, having collected several species of African big game. She is also a part-time college student. College? Yes, because she's still only 26 years old.